A Cessna Citation jet made a safe return after striking swans during takeoff from Roskilde in Denmark, according to an investigation report released by the Danish authorities. The Cessna 500 Citation I corporate jet operated on a commercial ferry flight from Roskilde to Merville, France. After take-off from runway 11 at Roskilde, the aircraft was established in climb with a nose-up pitch attitude of approximately 13-15°. Just before reaching the flap retraction altitude of 400 feet above ground level, the flight crew noticed “something white” in front of the aircraft. The commander, who was the pilot flying, immediately initiated an aircraft pitch increase, but almost simultaneously a “bang” was heard and a bump was felt in the aircraft, most likely coming from the underside of the aircraft. The flight crew observed large white birds below the aircraft. The flight crew realized that the aircraft had been hit by one or more birds, probably Mute Swans, and decided to leave the flaps at the take-off setting of 15°. Cockpit indications did not show any abnormalities and the aircraft handling and controllability did feel normal by the flight crew. In order to return to Roskilde, the flight crew performed a visual traffic pattern and approach to runway 11, followed by a normal landing and roll-out. The aircraft taxied to the run-up area for runway 29, where an inspection performed by the fire and rescue service personnel revealed that fuel leaked from the left wing. Based upon the angle of climb of the Mute Swan and the altitude of 400 feet above ground level, the Danish AIB finds it unlikely that the birds, which hit the aircraft, were residing close to Roskilde Airport. In the opinion of the Danish AIB, it is difficult for an airport operator to mitigate the risk of birdstrikes under such conditions, as it is unrealistic to expect a complete control of or warning capability against birds residing at unspecific locations away from the airport. The accident was caused by a multiple birdstrike. Up to four Mute Swans damaged the left wing leading edge and the nose radome which resulted in bending of the skin and the stringer structure beneath. 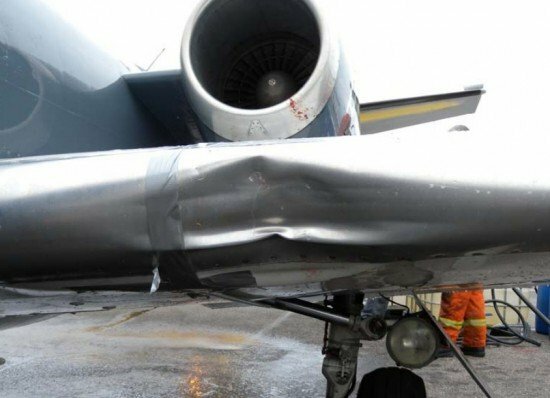 The left wing integral fuel tank structure was damaged resulting in a fuel leak. The lighting condition in combination with the colour of the birds. The small relative movement between the birds and the aircraft. The aircraft nose-up pitch attitude might have impaired the flight crew’s forward vision.